I've used Careers in the past to find people as well as to answer employers' / recruiters' questions about whether I was interested in a job or not. However, I had never used careers to actually "apply" for a job until today. I have posted in the past about bugs and confusion in the Careers website. You can also see various other questions tagged with careers on my profile page. When I submitted my application, it sent me an email with an attached PDF of my resume. When I opened my resume, it was a much older version. If I look at my current resume, it doesn't look anything like the older version; it has different information http://careers.stackoverflow.com/jhermiz. Where / what is this resume from, and why did it try to attach the old version of my resume vs. the new resume? I would have thought it would use the latest and greatest career resume. When I go to apply for another job, it cookies / saves the state of my cover letter. Why in god's name does it do that if the message at the bottom states "Hey you have already used this cover letter, you should make it unique"? If I apply for a job listing a popup comes up asking me for my cover letter / resume. If I press Esc / cancel out of it and go on looking through the site and happen to "back" my way out using the browser - this popup comes up again even though I had cancelled or X'ed out of it. Once I applied, I clicked on the link to take me to my "Application". I thought "great this company has my old resume, let me update it / message them informing this". Well, you cant... the textbox is locked, and it says you cannot enter a message until after the company reaches out to me! Sorry I hate you Careers... I hated you years ago and I still hate you to this day. You are always broken! When I used you to find people, you were broken; when I used you to answer recruiters or people looking at my information, you were broken. You were even broken when I applied for a job. When will you ever be fixed? Now the company I applied for probably doesn't believe a lick of what I said in my cover letter, given my cover letter doesn't match what is in my current resume. Thanks... no really; thanks! Let me ask a serious question to the developers or QA team of the Careers site: have any of you actually used the site to test the experience of applying for a new job? If so, how do you find the experience? Did you notice all the weirdness or quirks? I know they exist, because they happen to me every time I use Careers. If you are just coding and rushing and hoping things are working - they are, they really are, but they don't work as expected. There's a big gap between working and what the end user expects. As I said elsewhere, I'm really sorry this went so badly for you. We did a bunch of work on the apply button for Jobs on Stack Overflow and we took some of your issues here into account. There's only one step now, instead of the multiple steps in the old and busted process. You just fill out the form and click submit. Because there's fewer steps and less state I hope the two messages about what we'll include in addition to your application are clear. A link to your CV is always included in the application, so we tell you that in the yellow bar, inviting you to edit it to make it right before you send the application. Changes to your CV are always live, so if you update your CV after you apply, they will see the changes when they go to the link. In the resume section we tell you that if you do not upload a resume, we will generate a PDF of your CV and attach it to your application. It will be generated when you click the button, so it will be a snapshot of the information on your CV as of the time you applied. You can preview what it will look like by clicking the link there. 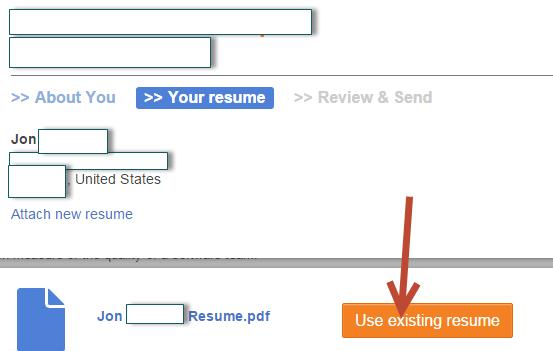 There is no more "Use Existing Resume" and we don't try to prepopulate your resume on this application with one from a previous application. 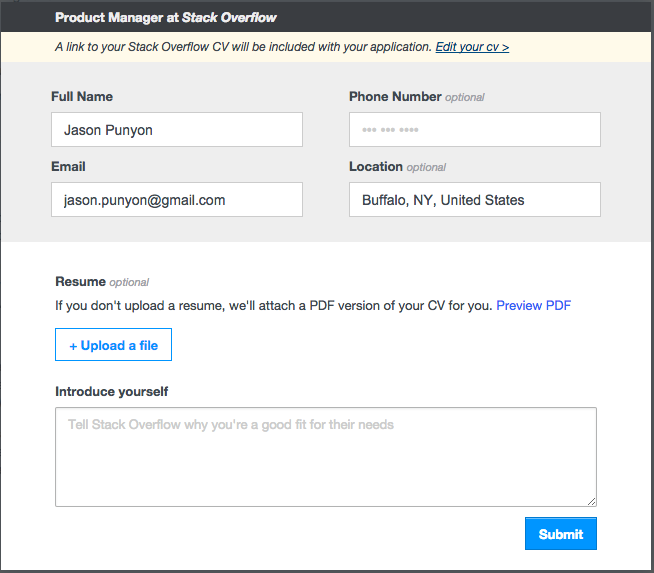 The same for the introduction field (we used to call it Cover Letter). We won't prepopulate the field anymore. We didn't make any changes to the messaging here, but you're right it's silly we don't let you follow-up as an applicant. I hope this is better / less confusing. Leaving this open as a bug, because the workflow is unnecessarily confusing and potentially disastrous as it stands. In the meantime, please be aware that you'll need to re-export your CV after editing in order to update the PDF. As always, if something seems confusing or misleading, don't hesitate to post about it here. And if you have problems specific to your account, don't hesitate to email careers@stackoverflow.com with details - we'll do our best to get you sorted out. Applied for a job with wrong name. How do I fix it?